We've seen several gaming laptops from Asus in the past year and the company hopes its G71GX will be its most complete machine to date. 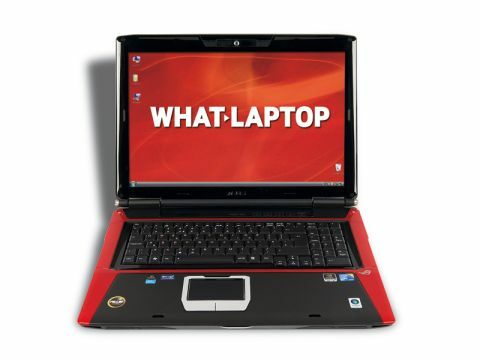 It features a 17-inch screen and it has a 1920 x 1200-pixel resolution. Images are pin-sharp with vibrant colours, making it ideal for gaming and watching high-definition (HD) movies. This is something that's also made easier by the inclusion of its Blu-ray drive. The glossy Super-TFT screen can be reflective, but we never found it overly intrusive – even in the brightest conditions. A single graphics card is used– Nvidia's high-end GeForce GTX 260M. It doesn't offer the same levels of power as some rivals, but it's a reasonable compromise, with a much more affordable price tag. We were still able to play the latest games with relative ease, although the high resolution meant we did have to lower detail settings for more demanding titles. Style-wise, the chassis is distinctive and colourful, although the glossy plastics lack the high-end feel of the Alienware's metal finish. That said, it's a robust machine that should easily withstand long gaming sessions. The screen is also firmly held in place, with no sign of movement when you're typing or frantically hitting the keys when playing games. The keyboard offers excellent comfort. The sparkly finish won't suit all users, however, and it lacks the backlighting of the Alienware. A full numeric keypad sits to the right of the main board, aiding data entry and gaming. The touchpad is large and responsive, although we still prefer a mouse when it comes to fast and accurate control during games. Asus has opted for a Core 2 Quad chip – a quad-core processor offering excellent multi-tasking capabilities. Performance is held back slightly by the use of 4096MB of DDR2 memory – compared to the faster DDR3 memory used in other gaming laptops – but it's still a very fast laptop during daily use. It also easily matches rivals when it comes to features. Storage is excellent with two 500GB hard drives to store your games, music and media collections. There's also an eSATA port – letting you transfer all your files to compatible external hard drives at high speeds. Overall, the G71GX is an impressive laptop at a good price. It's not the ultimate gaming machine, but the custom chassis places it above the Novatech and Cyberpower when it comes to design. It can't match the style and quality of the Alienware, however.